Imagine if your body was a fancy sports car. What kind of fuel would you put in it? Would you give it the best fuel you could buy or whatever was around? Your body actually is a little like a sports car. When you give your body good food every day, you have energy to grow and play. You get sick less often. You grow and become strong. If you give your body poor fuel, it won’t work as well. You might have less energy or get sick more often. Your body needs minerals, vitamins, fiber, fats and protein every day. Each of these foods has a different purpose. Read on to find out what is healthy food for your body. So what kind of fuel does your body need? Your body needs minerals, vitamins, fiber, fats and protein every day. Each of these foods has a different purpose. Minerals make healthy skin and strong bones and teeth. 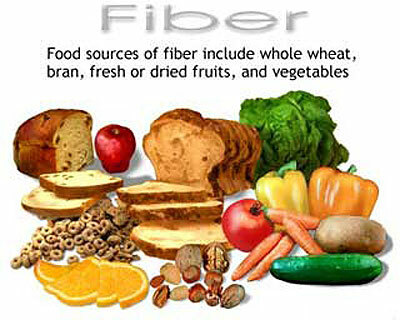 Fiber helps your body digest food. It is found in vegetables, whole grains and fruit. Vitamins help your body stay healthy and fight disease. Vitamins are found in fruit and vegetables. Fats in milk products, meat and fish help your body build healthy nerves and fight off disease. Protein, which is found in meat, milk products, beans and fish, builds muscles and repairs damage. What is healthy food for your body? 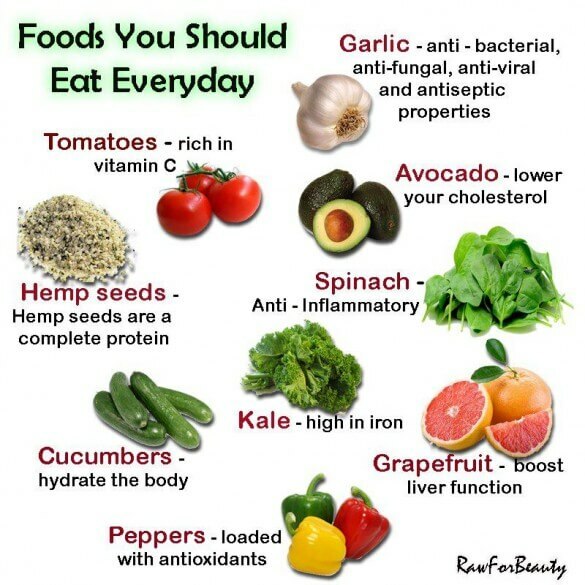 These are foods you should eat everyday. Fuel: material that provides energy. Gasoline is a kind of fuel. A very funny but true and informative video about unhealthy foods and why they are harmful. If you have sensitivity to what some consider inappropriate language, then best do not watch it. There is one such instance in minute 3, where presenter says you are damaging your liver, especially when using Agave syrup with alcohol and uses the F* word. We kept this video for its honest and informative value as well as entertaining presentation. Let us know if this is the right decision or if you can recommend a better video equivalent without the F* word yu know about which we missed – add a comment below. Thanks! Question: What types of food should I eat every day? Answer: Try to eat lots of different kinds of food every day. Brightly colored fruits and vegetables are especially good for you. You also need milk, cheese, meat and whole grains like brown rice or whole-wheat bread. Question: Are there any foods I shouldn’t eat? Candy, sweets, soft drinks and sodas. Eating these will rot your teeth, cause you to gain weight or even make you sick. See Mercola.com website for info on how sugar can kill you and damage your brain. Dr. Mercola writes: “This Addictive Commonly Used Food Feeds Cancer Cells, Triggers Weight Gain, and Promotes Premature Aging”. High fructose corn syrup and Agave syrup. Fast foods like McDonald’s and others, greasy oily foods cooked in bad types of oils with unnatural modifications like those made from Genetically Modified crops and ‘reduced calorie’ lab oils that are not natural which are used for potato chips and fried snacks. Best use organic cold pressed olive oil for your salads and for simple low heat frying and cold pressed coconut oil when frying on very high heat things like a steak. GMO/GE foods of any kind; especially dangerous are potatoes and corn. Genetically modified foods are associated with growing cancer rate, infertility rate and many diseases. Lab animals refuse eating them and so should we. Bees and some insects are dying out due to the pollen from these crops. The Chinese government recently banned the sale of GMO rice in China to avoid making their population sick. However they export it to many other countries. Best eat organic food and make sure it is organic at the seed level, as some GMO vegetables and fruits are being inoculated with all kinds of drugs and pesticides. Dairy products – considered primary risk for breast cancer and other sicknesses, including respiratory problems. Especially when not from healthy free range organic source and if not raw milk. MSG in your food is dangerous for your health. Most snacks and commercial foods and even many restaurants use MSG to enhance flavor of food but it is not good for health. And plenty more – read Mercola.com for good information on foods and how to eat healthy and safe! Enjoyed the Easy Science for Kids Website about What is Healthy Food For Your Body info? Take the FREE & fun What is Healthy Food For Your Body quiz and download FREE What is Healthy Food For Your Body worksheet for kids. For lengthy info click here. Declan, Tobin. " Fun Healthy Food Facts for Kids ." Easy Science for Kids, Apr 2019. Web. 25 Apr 2019. < https://easyscienceforkids.com/what-is-healthy-food-for-your-body/ >.